Sunday began early. Up by 5:15 for a 7:12 flight from Juneau to Anchorage. We've finally realized that for domestic flights from these smaller airports, we don't need to allow the time cushions essential in a crowded terminal like Atlanta. So we left the hotel about 6:20 and arrived in plenty of time to return our rental car, get boarding passes printed, make it through security screening, and still have time to wait at the gate before boarding. Arriving in Anchorage after an uneventful 1¼-hour flight, we immediately recognized that we were in a genuine city. Located at the head of the Cook Inlet in south central Alaska, Anchorage is home to more than 300,000 people, or about 40% of the entire state population. Only New York has a larger portion of its population (43%) residing in one city. For local comparison, the title of second largest Alaska city rotates between Fairbanks and Juneau, each with just over 30,000. Anchorage has an airport to match its status as a major city. As we had planned, Sunday was a recovery day for us. We picked up a gunmetal gray Jeep Latitude from Hertz, checked in at the Homewood Suites where we did laundry, and went grocery shopping for a road trip. We even bought a little paring knife, which we can't fly with as we don't check bags. Then it was time for planning our Monday drive along the Glenn Highway from Anchorage to Glennallen. 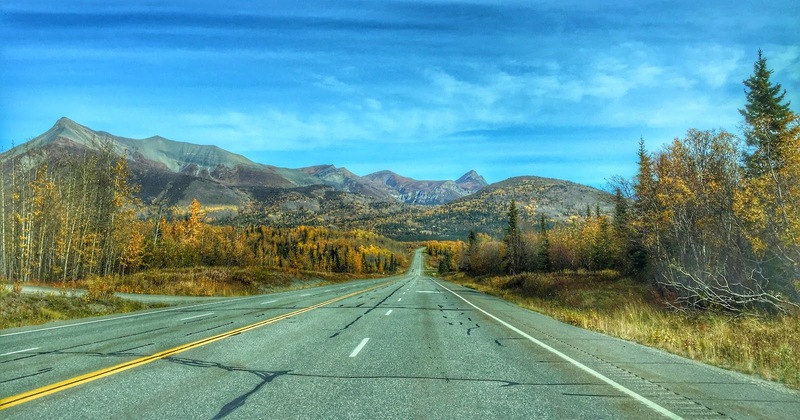 Like so many who visit Alaska, we have been using the legendary Alaska trip planner and travel guide, the veritable bible of north country travel—the Milepost. 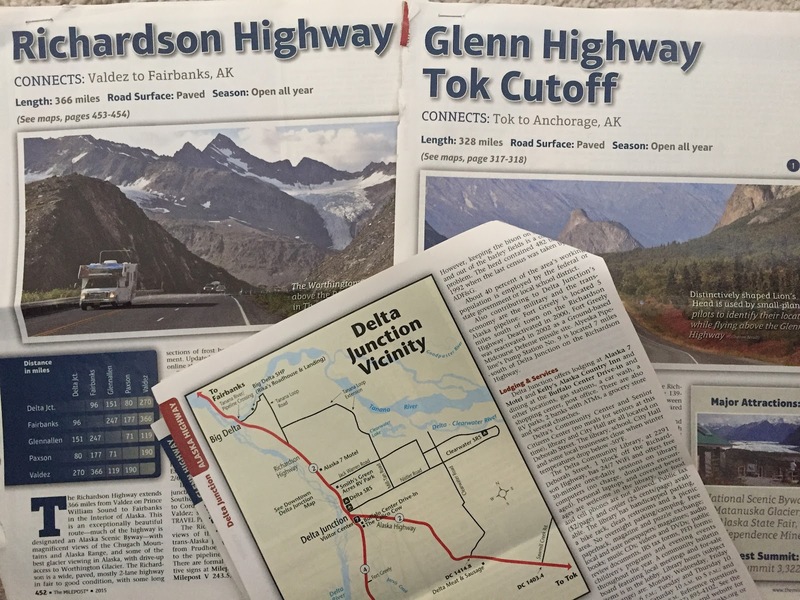 First published in 1949 to assist those driving the Alaska Highway, the Milepost has expanded to a full-service guide to the highways, ferries, attractions, lodging, recreation, and services along the major roads (and many minor ones) of the Alaska highway system. (It also includes some routes in Alberta, British Columbia, Northwest Territories, and Yukon Territory.) Updated annually, this year's issue offers more than 750 pages of information, photos, and maps. Some of the pages we harvested from the 2015 Milepost. Between the Milepost and our ClueTracker letterboxing app, Monday morning found us ready and eager to get this road trip started. Departing Anchorage on the Glenn Highway, we quickly left urban areas behind as we entered a rural zone with lush vegetation and sporadic dwellings. Half an hour outside Anchorage, we stopped to seek a letterbox hidden at Eklutna Historical Park. In a fascinating example of cultural blending, graves in the Eklutna cemetery are marked by the three-barred cross of Orthodox Christianity as well as traditional Athabascan spirit houses. 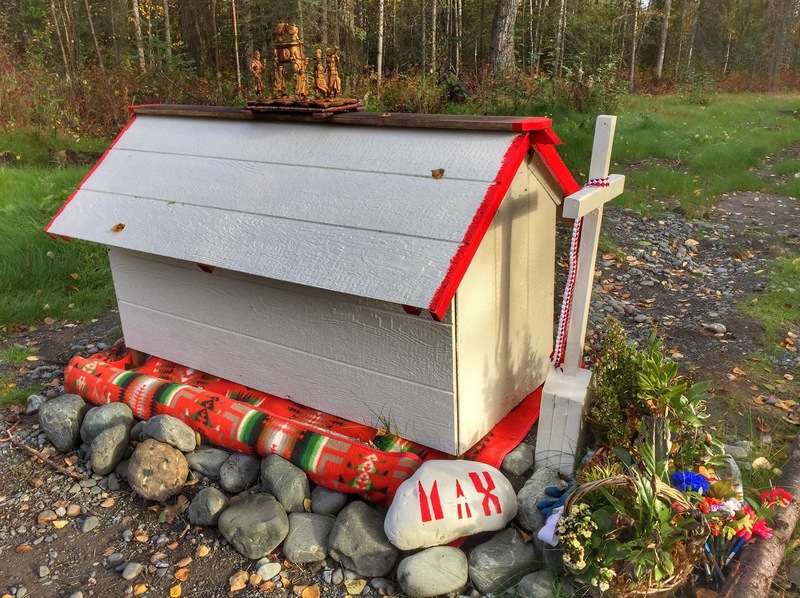 A spirit house—about the size of a large doll house—is placed over a grave 40 days after the burial to house the spirit of the deceased and his or her possessions. The colors of the houses in this cemetery are specific to the families in the community. Blankets are often placed on top of a grave instead of flowers as in other cultures. Distinctive family spirit house color schemes make it easy to find relatives' graves. The cemetery was in need of some upkeep when we visited today. A few miles beyond Eklutna, the Parks (AK-1) and Glenn (AK-3) Highways split. The nice wide four-lane went north with the Parks toward Denali and Fairbanks, while we followed the two-lane Glenn. But the road was well maintained and there was plenty to see as we entered the Matanuska-Susitna (Mat-Su) Valley, Alaska's agricultural heartland. Thanks to its glacially fertile soil, the absence of insect and weed pests that thrive further south, and a summer growing season with 19 hours of sunlight daily, the area has become known for its super sized produce. World record specimens of a variety of vegetables have been grown in the valley. 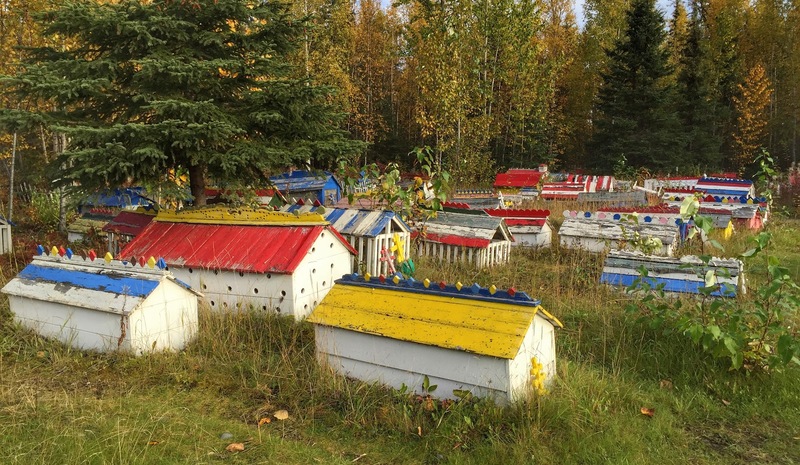 The Alaska State Fair in Palmer has recorded a 37-lb. zucchini, 53-lb. rutabaga, 18-lb. lettuce, 31-lb. cauliflower, 35-lb. broccoli, a 49-lb. celery, a 138-lb. cabbage, and the beast of beasts—a 1,469-lb. pumpkin. How do you find a refrigerator large enough to store these? We learned all about these giant veggies from the clues to a letterbox we found hidden at the Alaska State Fairgrounds in Palmer. Not far beyond the fairgrounds, a large yellow warning sign along the Glenn Highway urged: Moose on Road | High Crossing Area. In a section with adjustable numbers, the sign also informed us that 41 moose have been killed on Mat-Su roads since July 1. That's four each week! It may be small but it has a post office, and you can buy fresh eggs there, according to the signage. Near the confluence of the Matanuska and Chickaloon Rivers, we breezed through the tiny village of Chickaloon (pop. 200), established in 1916 as a railroad terminus. 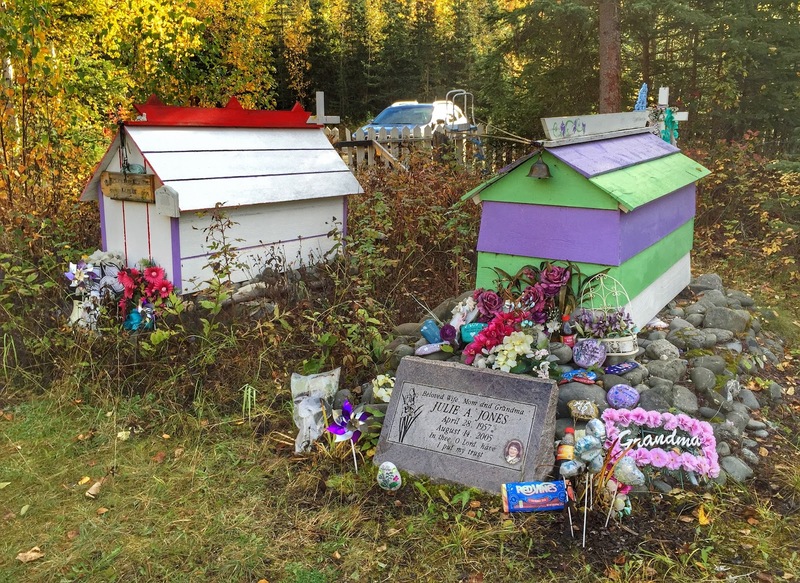 It is the home of the Chickaloon Village tribe of Native Alaskans, who have been battling the state of Alaska for several decades over the tribe's claim to sovereignty. At one time the village even issued its own license plates and driver's licenses. Most recently a state fire marshal inflamed tempers when he issued a stop-work order on a tribal building which had been issued a village construction permit but lacked one from the state. We drove on, trying our best to avoid the fracas. The slate color of the river contrasted with fall's bright yellows. As we continued north on the Glenn, we followed alongside the gray ribbon of the Matanuska River. The river flows from the large Matanuska Glacier in a swift, silt-filled stream. Cottonwoods, willows and aspens provided a burst of fall color, all in shades of yellow and gold. 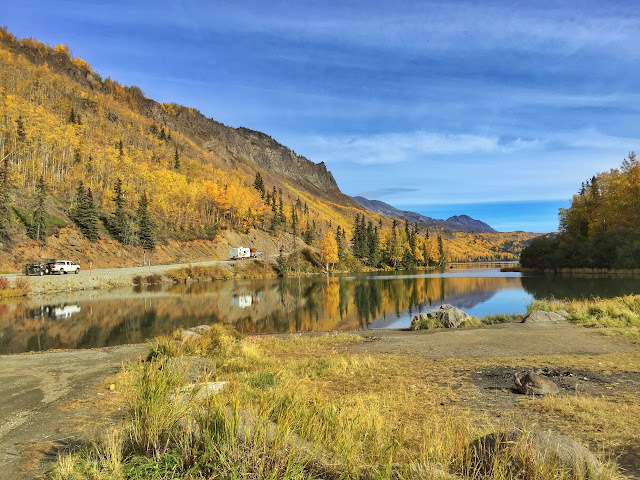 We couldn't resist pausing at the scenic Long Lake, a popular fishing spot adjacent to the highway, to take a few photos of the gorgeous autumn palette. Even though there are no trees with red and orange leaves, as other parts of the country boast, the range of yellows with the contrast of dark evergreens and today's brilliant blue sky offered a fetching sight. A little further on, the Matanuska Glacier came into view and we longed to stop and visit the state recreation site attached to the glacier. But by then it was 2:30 and we were barely halfway to Glennallen, our destination for the night. We couldn't take another 5 hours for the second half. Hunting season for moose and caribou was in full swing, and near Eureka Pass, where caribou migrate through in October and November, a massive parking lot was jammed with trucks pulling trailers that carry big-boy toys. This time of year it's ATVs to access the trails through the rugged terrain where these big game are hunted. As we traveled the Glenn, we stopped to locate additional letterboxes at Granite Creek bridge near Palmer, Mendeltna Creek, and Matanuska Glacier Park near Sutton. This for-profit glacier park allows visitors close access to the Matanuska ice sheet for a minimum fee of $25 per person, but they were closed when we stopped by for the letterbox outside the entrance, so we didn't have to decide whether to participate in the extortion or not. A few miles past the Matanuska letterbox, we stopped at a paved turnout for a terrific view of Sheep Mountain. In addition to the fall weather that had turned grasses and leaves golden, the iron-stained gypsum deposits in the mountains give them a nice orange autumnal glow. Beyond Sheep Mountain, the terrain flattened out with mountains much farther from the highway, and thick, spruce-dominated forests lining the roadside. About forty miles before we reached Glennallen, Mount Drum and its Wrangell Mountain neighbors came into view. Drum was dominant because of its closer proximity. We followed this view all the way into Glennallen (pop. 483), where we stopped for dinner supplies at the local IGA supermarket. 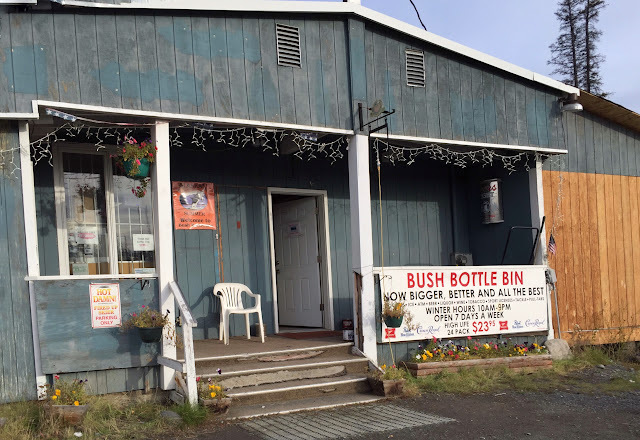 The Milepost mentioned a local liquor store with topiaries. Searching the GPS, we thought for sure we had found it when we saw Bush Bottle Bin. In Glennallen, we turned south on the Richardson Highway a few miles to the Copper River B&B, where we had reservations for the night. Upon our arrival, we met owners Quinn and Jeff and learned their interesting story. She is a native of Colorado, he of Wisconsin. They were married with two little children living in Colorado 20 years ago when Jeff came to Alaska for a hunting trip with a pal. After the friends were dropped off in a wilderness area for 12 days of camping and hunting, the weather turned bad, delaying their pick-up for nine additional days. 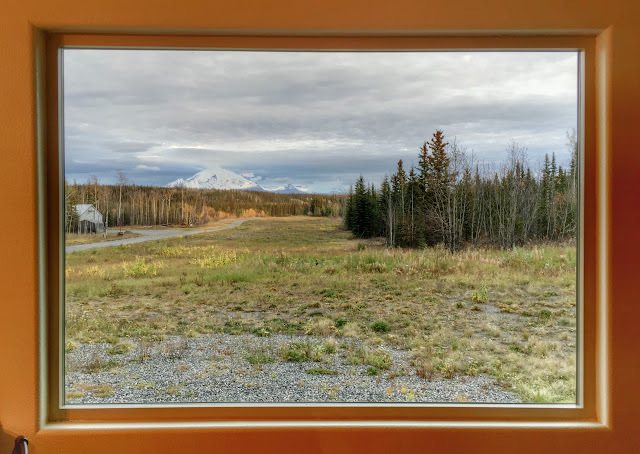 Looks like a painting but it's the dining room window from the B&B with a view of Mount Drum. When they were finally picked up, a fellow named Chuck was in the group of rescuers. On the ride back, Chuck learned that Jeff was a skilled high voltage lineman and his wife a teacher. Insisting Alaska needed such talented young people, Chuck encouraged Jeff to return with Quinn and stay with him to see how they liked Alaska. When they did, the young couple was sold on the appeal of America's last frontier and decided to make the big move. While they were looking for a house, Chuck arranged for them to stay in the basement apartment of his daughter and son-in-law's home for six weeks. And that's how a young couple from Colorado came to be houseguests of the future governor of Alaska and vice-presidential candidate of the United States. Tomorrow we'll continue south on the Richardson Highway to the coastal city of Valdez. Always carry a rubber band when you travel. You never know how it may come in handy. No need to wonder. Yes, there are moose here.